Objectives: Explain and illustrate what is meant by hijab and the importance of this to Muslims. Modesty: A humble, unpretentious manner or appearance. Hijāb: A term often used to mean scarf or outer garment that Muslim women wear, but in Arabic it means a ‘cover’ or ‘screen’. Khimār: A scarf that covers the head, shoulders and chest of a woman. Jilbāb: A large outer garment, one piece or two pieces, that covers the entire body except the face and hands. Allāh has mentioned here reasons for clothing: to cover the body and conceal what should not be revealed in public, and to beautify the body so the person looks better. Islamic clothing is known by its modesty. A Muslim is allowed wear whichever clothes he wishes so long as they are modest, free from impurities, not made forbidden materials and within textual guidelines. Textual guidelines means that it must abide by the commandments of the Qur’ān and Prophetic Tradition. Women are also told not to display their finery. This means that dress is meant to protect the wearer from harassment and to prevent one from becoming obsessed with pride in one’s outward appearance. It is also a way Muslims can develop a society that respects the boundaries between men and women. In this way each person is judged for their piety, honesty, hard work and values, not mere outward beauty and fashion. Many Muslim women completely conceal themselves in a ‘jilbāb’ (outer garment covering them from head to toe), along with gloves, and a face veil (niqāb) that allows only the eyes to be seen. All of this is from Islam, however not all of it is obligatory: the gloves and face veil are not obligations, but merely recommendations and most women choose not to wear them. So the hijāb is the Islamic practice of preventing women from being seen by men, except by their closest male relatives (referred to as mahrams). Men are not allowed to shake hands with women unless they are closely related to them, such as one’s wife, daughter, paternal aunt, maternal aunt, sister, etc. The practice of seeking a marriage partner must be done without dating or courting. Families from both sides must be involved from the outset for a marriage to be correct. In the case of women who have converted to Islam and have no Muslim relatives, then their guardianship for marriage becomes the responsibility of the head of a mosque or Islamic centre. Clothing must cover the entire body except for the face and hands when in the company of non-related males. Clothing must be loose, so the shape of the body is not seen. Thick enough so that it is not see-through. Should not resemble the clothing of men. Clothing must conceal whatever is between the naval and knee. Must be loose and thick, so that the private area remains concealed. All garments must be above the ankle bone. Should not resemble the clothing of women. It cannot be made of silk or coloured/dyed with saffron. Hijāb: A lot of people mistakenly think that hijāb means a headscarf, but it actually means “a screen” or “cover”. The word khimār means scarf which is worn over the head, shoulders and chest of a woman. The jilbāb is an outer garment that is worn over the ‘house-clothes’ and over the khimār of a woman. The jilbāb covers her from the head to her feet. It can be one piece or two pieces – and she wears it before she leaves the home or when in the company of non-mahrams (unrelated men). The Prophet (peace and blessings be upon him) said: “When a woman reaches the age of adolescence, it is not correct that she displays any part of her body except this and this – and he pointed to his face and hands.” (Abu Dawood 4104) This hadeeth is a clear proof for the obligation of covering the body for a woman. Modern attitudes: There is a trend among some Muslims to avoid adhering to the Islamic dress-code as they find it hard to stick to it in a modern Western country. They feel strange and do not like the unfriendly and even abusive comments that they may sometimes encounter. They understand that in a more tolerant society, they would be accepted as normal practising Muslims. Other Muslims, males and females, decide that regardless of the occasional Islamophobic attitudes, they will not allow the practice of their faith to be compromised, and their love of Allah and love of adherence to his laws outweighs any hardship they face from a minority of unfriendly and Islamophobic people in society. There is yet another group who believe that the hijāb and the Islamic dress code is outdated and not fit for our times, and regardless of the Quranic and Prophetic law obligating it, Muslims must abandon these ancient religious practices – and some go as far as to say that the hijāb should be banned altogether. Practicing Muslims find this attitude scary because it seeks to stop them from the practicing their religion freely, to alienate them, and their religion. 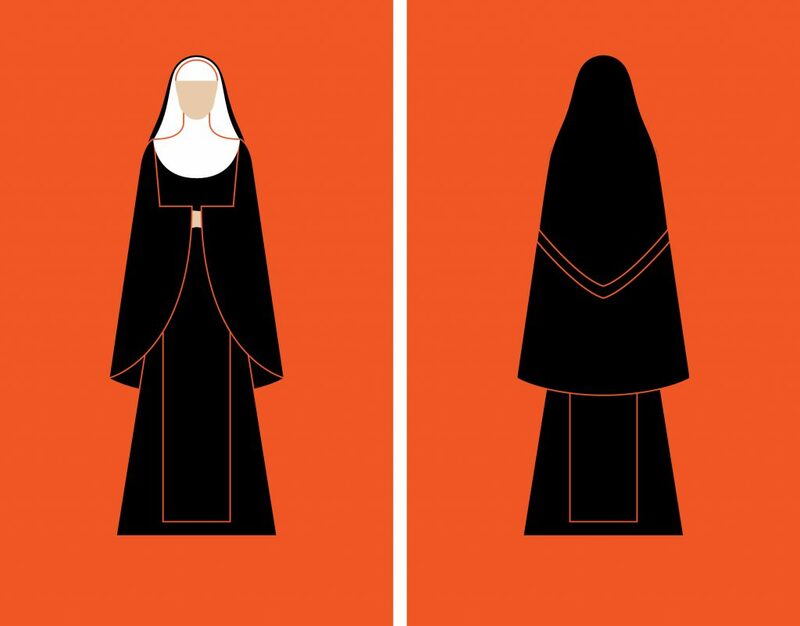 They ask: Would they call for a ban on nuns and women of the church from their ‘habits’ and coverings that resemble very closely the hijāb of the Muslim women? Evidence shows that the vast majority of Muslim women choose to wear the hijāb and are not at all forced. They also ask that society respects their decision to choose their own way of life. What do you think non-Muslims in Europe and the US today think is “modest” dress? 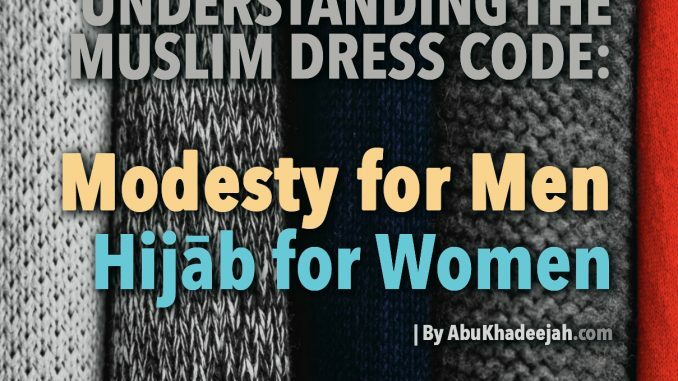 Why should Muslim women wear modest dress? Find and write down four reasons mentioned in this worksheet. What is modest dress for a man? What is the dress code for the Muslim woman? Objectives: Consider different attitudes to the hijab. Various styles of “hijab” are worn all over the world and this is fine as long as the conditions of hijab are met. Some Muslim women do not wear it at all. The Qur’an regards that as an act of disobedience to the Lord because it opposes a direct command of Allah Himself. Many outsiders wrongly think that women are forced to wear hijāb by men. This is clearly not how the vast majority of Muslim women see it. They are proud to wear the hijab as an outward sign of their faith and their modesty. Another reason women give for wearing the hijāb is that it makes men treat them as people. They feel that women in countries like Britain are only valued by men for their looks, and that Western women have to dress to please men if they are going to get on in society. However, Muslim women want to be treated as individuals, not as mere objects on display for men to see in public. 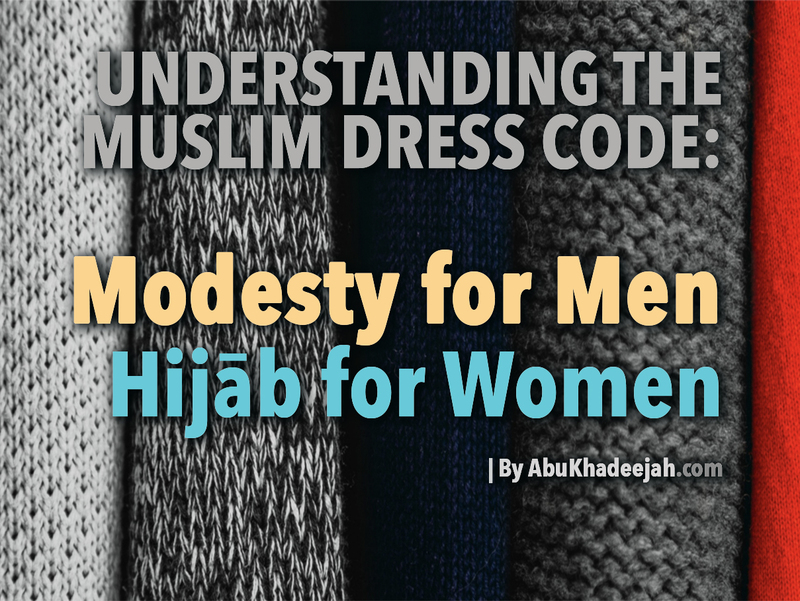 In contrast, some people do not think it is necessary for Muslim women to wear the hijāb. They give many reasons such as: “We are living in a modern society where the hijāb may seem backward,” “The best of clothing is piety, so I will just be pious and not wear the hijab,” “the hijāb is about behavior, not about clothing,” “people get scared off by the hijāb,” “you can’t get a job if you wear the hijāb,” and so on. These arguments contradict the clear verses of the Qur’an and the numerous commandments of the Prophet (peace be upon him). True, the hijāb can be a challenge for some Muslim women living in the West, but they are encouraged to put God first rather than their fears, personal feelings or the negative attitudes of society. There is a growing trend of institutes wearing the traditional ‘habit’, including The Benedictines of Mary, Queen of Apostles (only founded in 1995), who wear the full habit, complete with a veil and the voluminous cuculla (a type of choir robe). Lucienne Roberts says, ‘For us, these choices raise complex and thought-provoking questions about identity, purpose and visual symbolism.’ Source. Give three reasons why A’ishah has chosen to wear the hijab. The way a Muslim woman appears is very important. Do you agree? Does it matter? Give your reasons. Some people say: “It doesn’t matter how you dress – and people shouldn’t judge you”. Others respond: “but people will treat you differently depending on how you dress and in the end it is God who has told you how to dress not people, and He will judge you.” Which one do you agree with? Why? Is it correct for people, politicians and media to look down on women who wear hijāb? Explain. Look at the dress of nuns in a church. Does it look as though they wear hijab? Do you think they are treated differently to Muslim women who wear hijab? (Here is a good way of explaining to non-Muslims the importance of hijab and not being afraid of it since even devout Christian women wear “hijab”). What is the meaning of: a) hijāb b) jilbāb c) khimār d) niqāb – which of these is obligatory and which is recommended. I initially compiled these worksheets for my students at the Redstone Academy (aged between 13 and 16 years), Moseley Road, Birmingham, UK who were working towards their General Certificate of Secondary Education (GCSE). I felt that others who do not attend the school could also benefit from these topics since they are presented in simple bitesize chapters. I have relied upon GCSE text books and adapted them (quite a lot) for my classes.